If you follow my blog you'll know we've been renovating a home built in the 60's since last September. 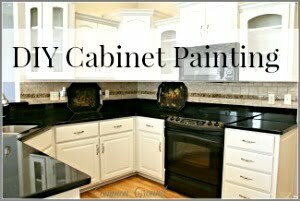 It's been a long drawn out situation and we're still finishing up at our previous house, readying it to go on the market. I've had decor and seasonal boxes at both places and some of it's still packed in boxes at our storage unit. 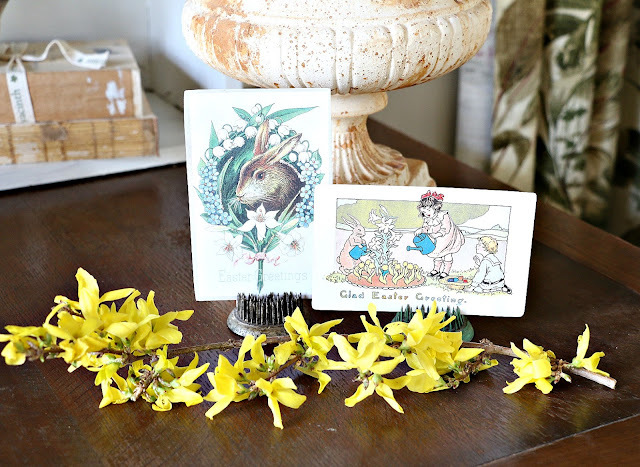 As we were moving in February I tried to think ahead and locate some of my Spring and Easter things, but much of it was packed away last August. So, I'm a little light on Spring dishes and decor, but I managed to put together a few fun things in the Garden Room. I was so excited when buds and blooms started appearing in the new yard and discovered a row of four Forsythia bushes along our back property line. They had been severely pruned back so I had no idea last Fall what they were. When I saw the little yellow blooms opening up I was thrilled. I had quite a few boxes in our storage room at the old house that hadn't been opened from our last move 5 years ago. I'd forgotten about an Ironstone Bowl and Pitcher securely hidden away. I found them a few weeks ago and thought the pitcher would be the perfect vessel for the Forsythia branches. 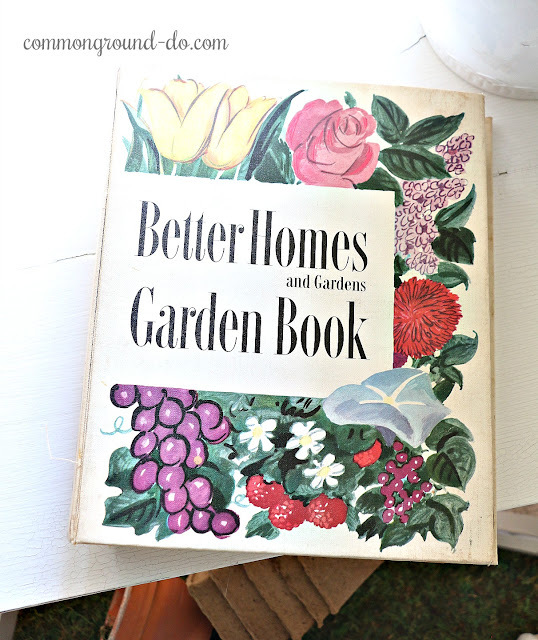 I've enjoyed this vintage Better Homes and Gardens colorful spiral Garden Book with still useful info of most types of plants, shrubs, trees and flowers found in the U.S. It was first published in 1951 and this edition is from 1954. It's the same wonderful format of their original cookbook that I received when I was newly married. I still have the cookbook and use it for many "staple" recipes. and is here hanging on the old cupboard. but I borrowed it for a bunny hutch this Easter. My handsome Mr. Bunns likes his little French wagon with some old garden pots. and a pair of vintage ducklings in the Seed Box. brings in some Spring like floral shades of blues, pinks and yellow. and use it every year for Spring. This is my office window looking out to the Garden Room. This space is at the back of the house and was an addition from just a few years ago. The old table had been in the basement at our last 2 houses, so now it's getting an opportunity to show off a little. It opens up for a bigger spot that could sit a few extra people during the holidays. Right now, I have things still scattered around waiting until I know more about where I want them. Might as well stack some boxes with a sheep on top while I'm figuring out where everything should be displayed. Thanks so much for coming by. 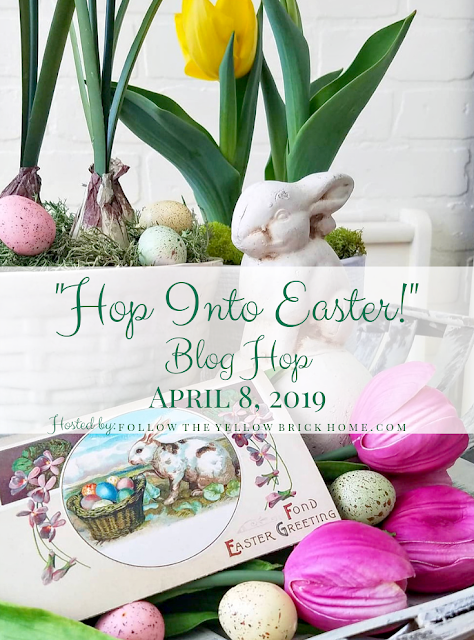 I hope you'll continue the "Hop" and see Marty's beautiful and elegant home dressed for Spring and Easter. Just follow the links below for some wonderful Spring Inspiration. I just adore your garden room and all the spring decorating in there. 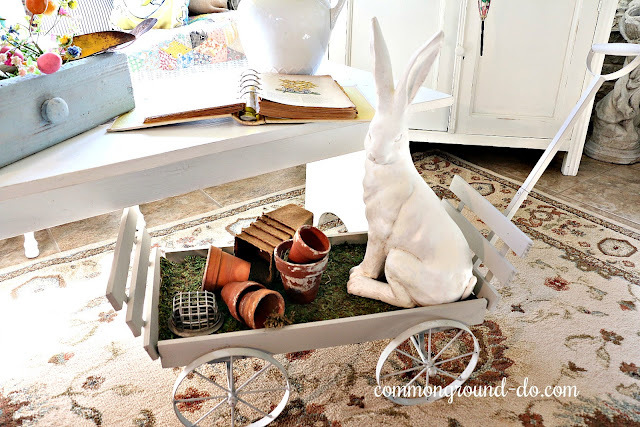 So many beautiful items...I love the Better Homes and Gardens book and that french wagon with the bunny and pots is just perfect! Thanks for the lovely tour and I hope you are feeling better! Just precious. Welcome back. I just love your spring decor. Your garden room is darling! Your garden room styling is always perfection. Debra your Easter vignettes are truly spectacular. I now will be searching for my own BH&G Garden book. It is fabulous! 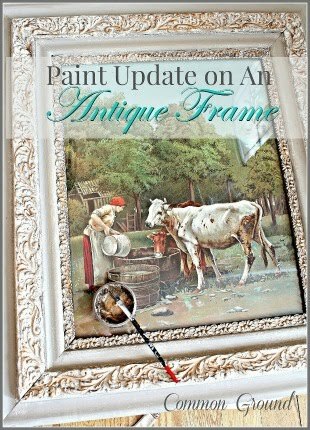 I love your beautiful antiques and how you always style them. So pretty and your new garden room is where I would hang out all the time. So sweet Debra. I love it all. So fun to see all the Easter decor. Always love your little wagon decorated for the holidays. Have a great beginning to the new week. 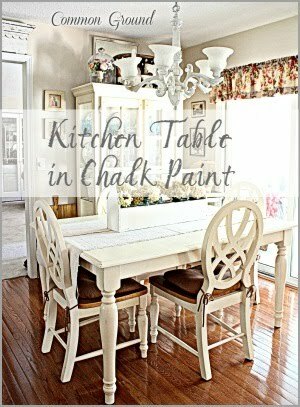 Debra, I love all your vintage touches; the little wagon is precious; the blue chippy drawer is perfect for gathering other items. Love the forsythia in the white pitcher. Your sunroom is a delight and must be a wonderful place to relax and enjoy spring. Hope you are enjoying your new home. This is so pretty, Debra! 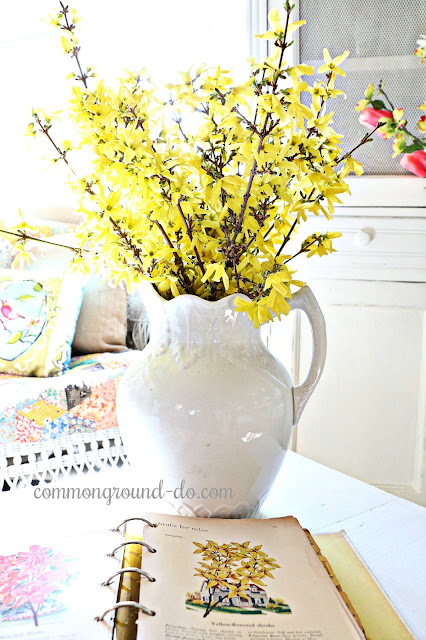 I would have been thrilled to see those forsythia blooming, too...the are beautiful in the ironstone! You are settling in so nicely! Most of my stuff is in boxes, too! 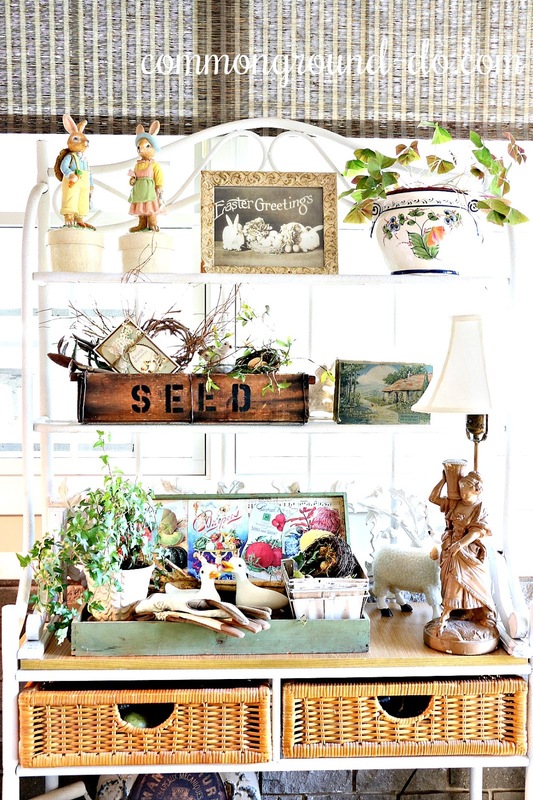 Your Garden room is perfectly spring and so fun to look through. I enjoy each little space of cuteness. Got a lot of ideas! 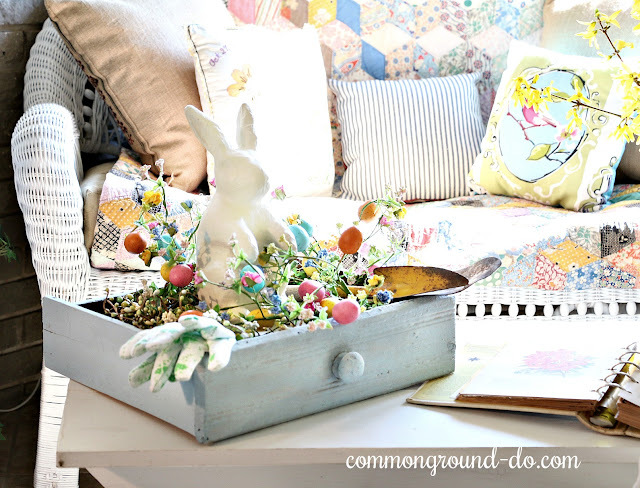 It is hard to believe from your lovely displays that you don't think you have a lot of spring and Easter decor! All of it is fantastic! I love the bunny with the terra cotta pots and moss in the wagon, and your blooming umbrella is just delightful! 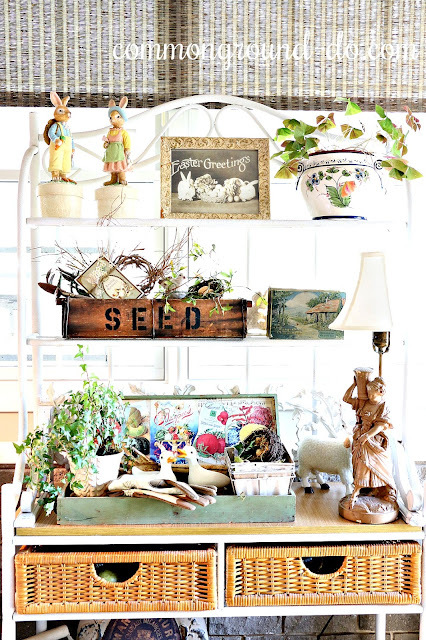 Thank you so much for sharing a peek into your home! This couldn't make me any happier, Debra - you've got your mojo back! It looks so cozy, so vintage, so YOU. I love it all. I am pining for more restful days of playing house. Glad you have the forsythia bushes - they are the very first welcoming signs of spring here in our region (along with early morning chirping birds). You've certainly made your house your home. Your home is so inviting and is all dressed up for the Easter/Spring season. Your bunnies and wagons are so cute. Love how you have them styled. Your vignettes are so cute! I love Mr. Bunns in his wagon! Love all of your vintage touches too! Beautiful! I would love to find one of those BH&G books. Everything looks lovely! Debra, Living in a renovation can be quite the mess! You sure pulled this room together beautifully! I love how you use the quilts to cover the cushions. I need to try this on my porch! Happy Spring! Your home is charming and inviting. 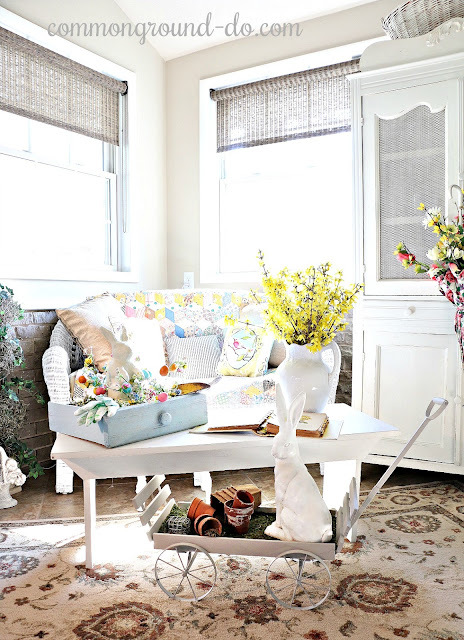 I love your pretty sun room and you have dressed it with plenty eye-catching spring decor. The little Easter vignettes are adorable. Welcome back. 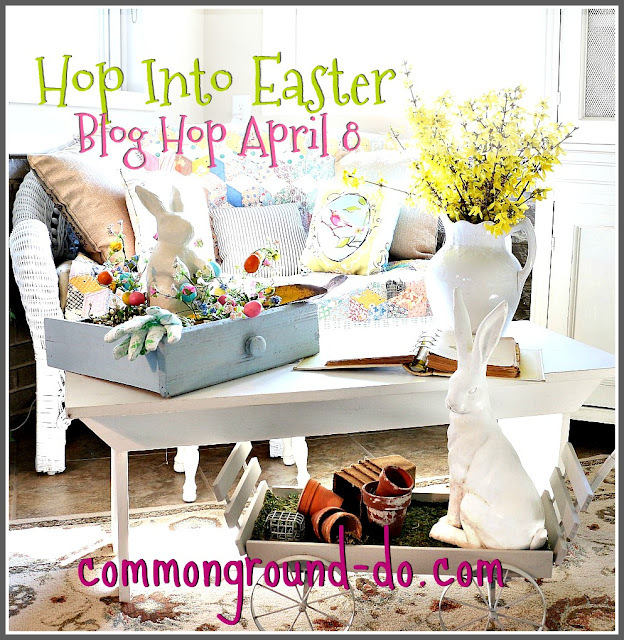 It was fun joining you on this blog hop. 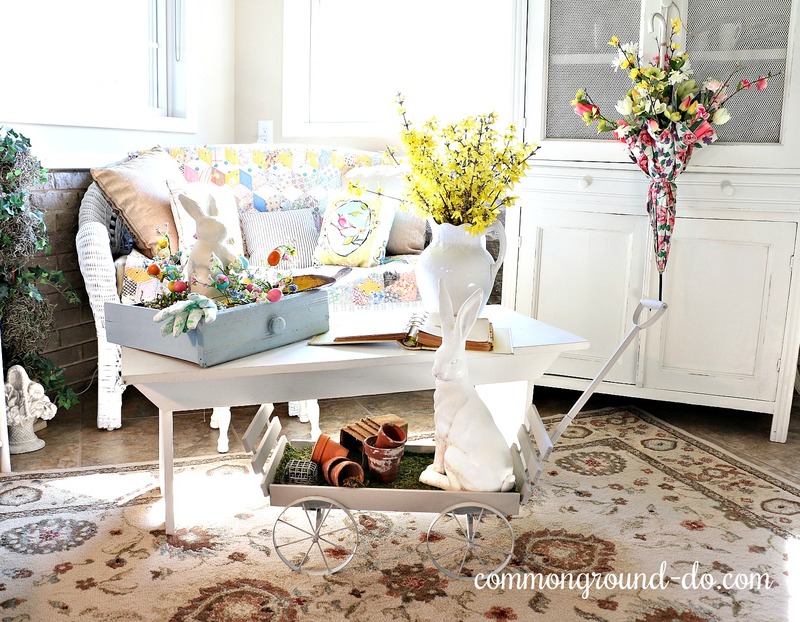 Your home looks beautiful decorated for spring! 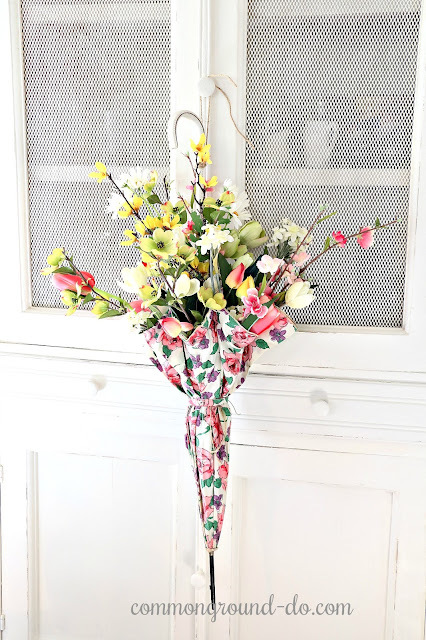 I love your umbrella floral arrangement, I've always wanted to make one of those! And Mr. Bunny in the wagon is adorable! Debra it truly thrills my heart to have you back hopping with us again! This is a wonderful post full of spring and Easter goodness! 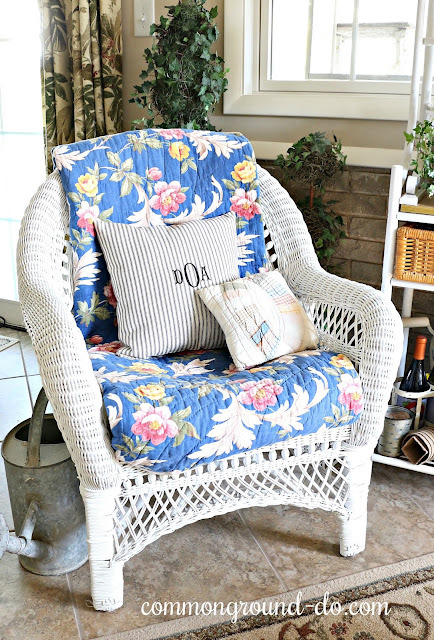 I can already tell you are going to have great fun in the sun room and we are all going to enjoy all of the beauty you share through the seasons. I am loving your little office space area and how you styled the table. 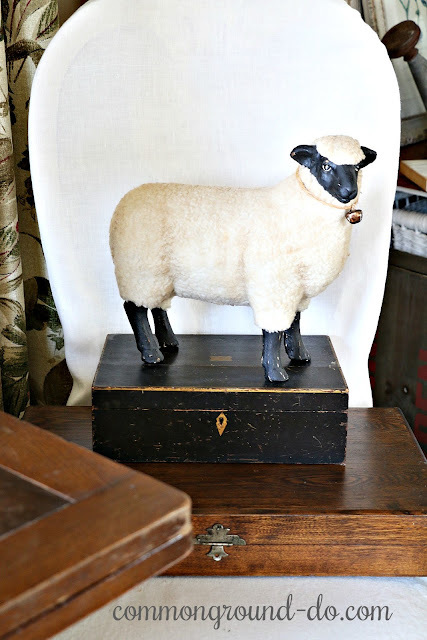 And please do stack sheep on boxes, it's delightful! How exciting to discover the forsythia bushes! 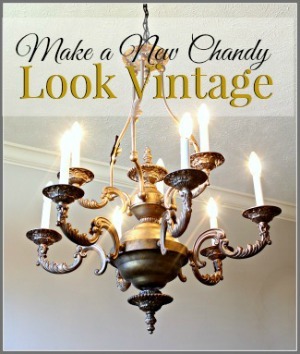 This means you will have plenty to style and I will have plenty of eye candy to pin! Thanks so much for joining this hop. Happy Easter! Loving all of these sweet spring touches!! 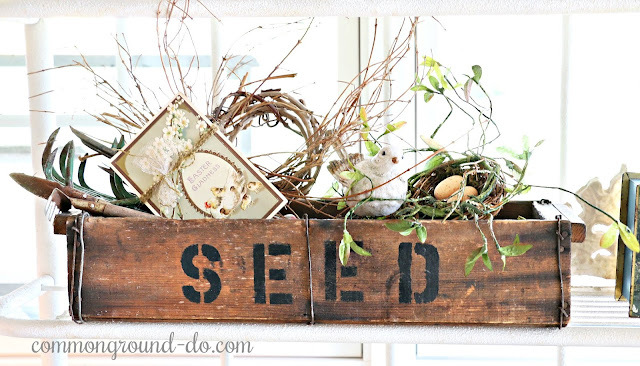 That seed box is sooo cute!! I love the way that you have styled everything!!! So pretty!! It is always fun to visit you. Your decorations always brighten my day. 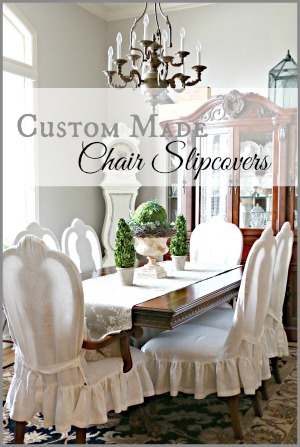 I have been following your blog for years and I absolutely adore your style. Debra, just stunning --- so many things pinned! It's nice to 'meet' you via the hop and I love your style. 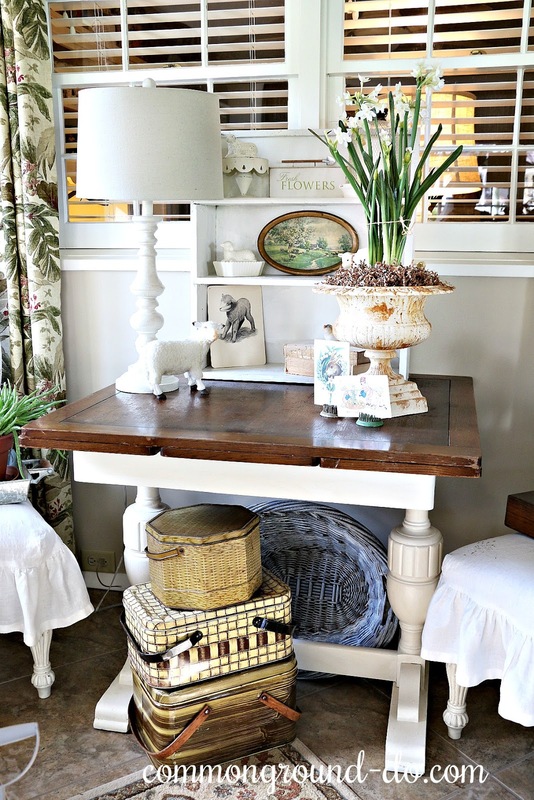 The umbrella is wonderful, using an antique drawer as the base of a vignette, H&G book, wagon, and the stack of baskets --- I want it all! 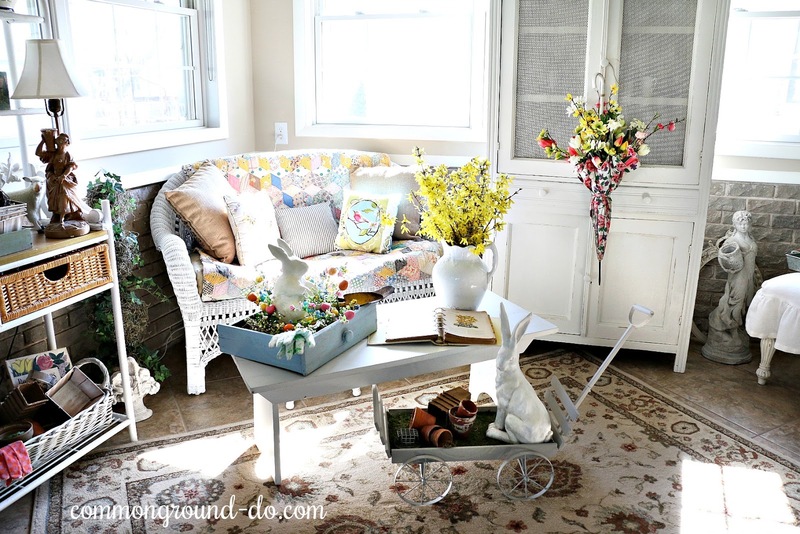 Your sun porch looks so pretty decorated for Easter. 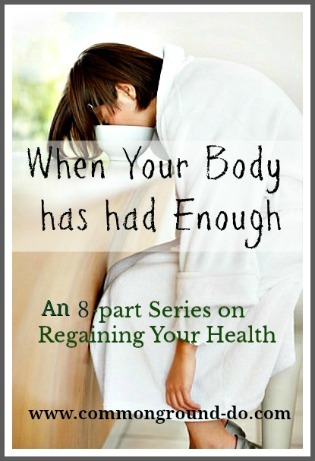 I'm glad that you are feeling better and are back to blogging. I am pretty sure that I've enjoyed your blog since the beginning and I've always admired your seasonal decor. It's going to be fun to see your decorations in your new home. I hope that your health continues to be on the upswing and I look forward to many more decorating posts from you as you get settled into your new home. 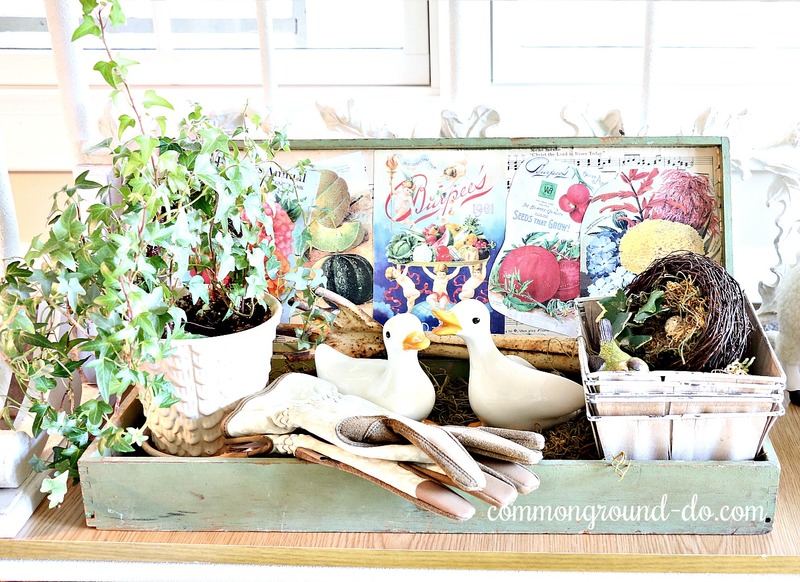 Debra, I love, love the BHG Garden Book! 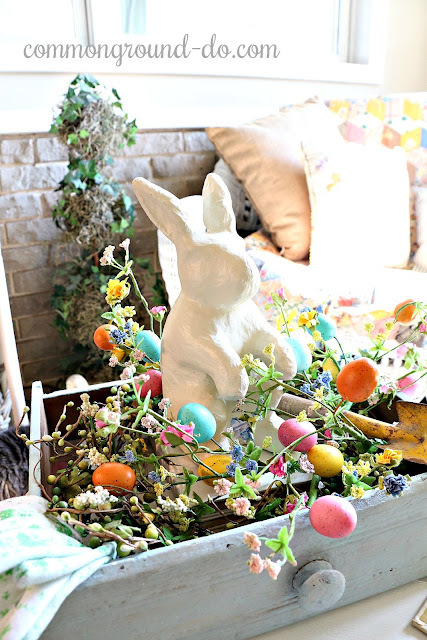 I also love your garden room and how you have it decorated for Easter. 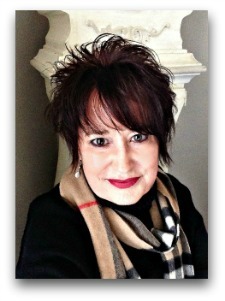 I've enjoyed being in this blog hop with you! Debra, you've really been busy. It all looks beautiful!! I am jealous over that garden book. Would love to find one. Forsythia is the first sign of spring to me and it brings wonderful color into your home. I adore your Brella filled to the brim with Spring florals! 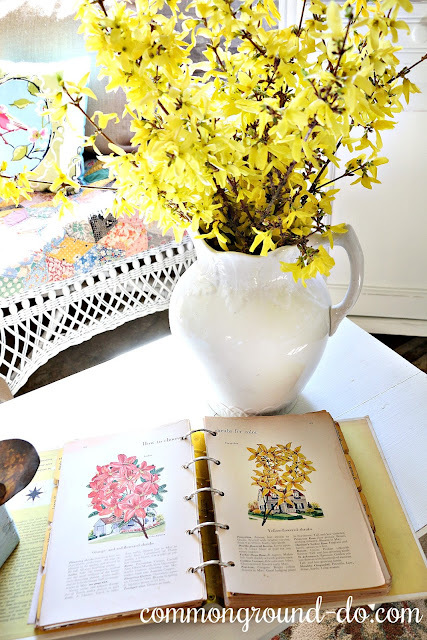 What a wonderful surprise to find you have forsythia bushes in your yard! The stems in the white ironstone pitcher are such a welcome to Spring. So many beautiful elements! 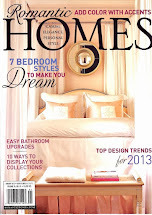 Hope to see you at Homestyle Gathering! I love all of your Easter decor. I am especially in love with that seed box!